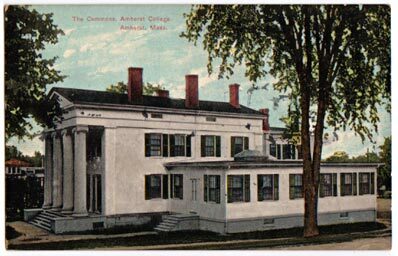 Hitchcock Hall, known alternately as The Commons, was located at the present site of Converse Hall, for whose construction Hitchcock Hall was razed in 1916. Built in 1835, the house was originally the home of Lucius Boltwood, and was known as Boltwood House until the College purchased it in 1892 with funding given by D. Willis James, whose name was later given to James Hall (King, 102-05). 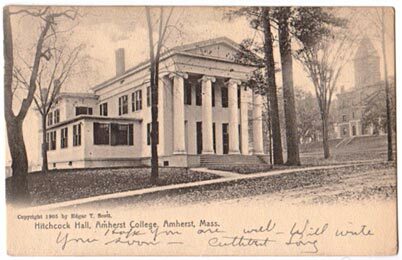 After purchase and remodeling, Hitchcock Hall was reopened as a dining hall, Amherst's first, to accomodate 100 students. The esperiment was not terribly successful. As President King writes in "The Consecrated Eminence," "For much of my course I ate at Hitchcock Hall. Student behavior...was often deplorable, and the board was never good" (105).